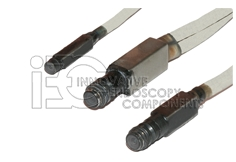 Endoscope CCD Camera (Chip) - IEC - Innovative Endoscopy Components, LLC. In 2002 IEC established its electronics department for CCD camera repair and connector assemblies. We specialize in the Olympus® CCD Repairs. However, we have performed other Endoscopy CCD Repairs from different manufacturers. Since the beginning, IEC has successfully repaired thousands of CCD’s for our customers and our own inventory. Models repaired include all Olympus® series large and small diameter CCD. Our success is unmatched and a benchmark for the industry.